Officials with the Massachusetts Department of Public Health (DPH) and the Boston Public Health Commission (BPHC) have confirmed the first case of measles in the Commonwealth this year, in an individual with an unknown vaccination history who recently visited Massachusetts from Europe. There have been potential exposures over the past week in the greater Boston area to include Harvard Square and Rockport, from May 1–8, 2016. MDPH and BPHC recommend that those potentially exposed call their healthcare providers or the health department with questions or concerns. Boston residents and exposed individuals who work or attend school in Boston should call BPHC at 617-534-5611. Those outside Boston should contact MDPH at 617-983-6800 or their local health department. Early symptoms of measles occur 10 days to 2 weeks after exposure and may resemble a cold with fever, cough, runny nose, and red eyes, but a rash occurs on the skin 2-4 days after the initial symptoms develop. 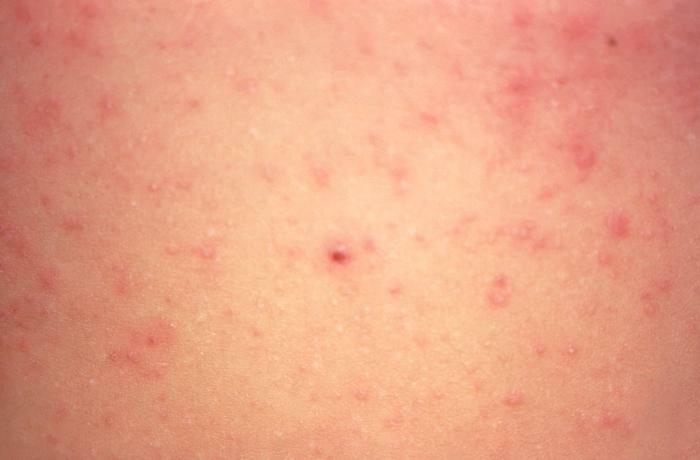 The rash usually appears first on the head and moves downward. The rash typically lasts a few days and then disappears in the same order. People with measles may be contagious up to four days before and for four days after the day the rash appears. People who have had measles in the past or who have been vaccinated against measles per Centers for Disease Control and Prevention (CDC) recommendations are considered immune. Those who think they may have been exposed to measles should immediately confirm that they have had two doses of MMR vaccine or have laboratory evidence of immunity to measles. Those without immunity to measles should contact their healthcare provider to get a dose of MMR vaccine as soon as possible. People born in the US before 1957 are unlikely to be susceptible to measles, but may consider getting a dose of vaccine. Young infants, pregnant women, and those with severe immunocompromising health conditions who may have been exposed are at particular risk and should contact their healthcare providers as soon as possible. A medicine called immune globulin may be given to help modify measles. Those who are unable to get vaccinated and have no other proof of immunity may need to refrain from all public activities for up to 21 days after the exposure to avoid spreading the infection. The individual with measles was in the following locations at the following times while contagious. Because measles virus can remain in the air for two hours, an additional two hours has been added to each location listed below. MDPH and BPHC recommend that those potentially exposed call their healthcare providers or the health department with questions or concerns. Harvard Square: Shopped at J August, 1320 Massachusetts Ave.
Massachusetts reported no measles cases in 2015. In related news, the mumps outbreak at Harvard has grown to 50 cases as of Thursday, May 5.